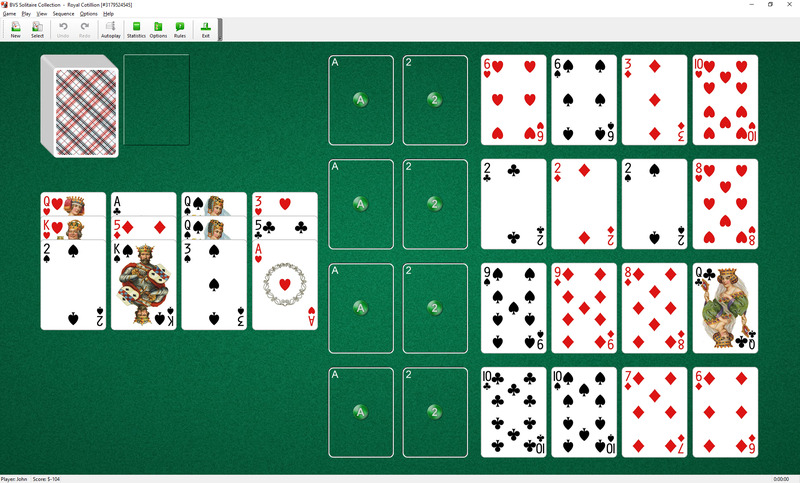 Royal Cotillion Solitaire uses two decks (104 cards). You have 16 tableau piles with one card in each pile and 4 reserve piles (with 3 cards in each pile). You also have 8 foundation piles. Aces and Twos of each suit are moved to the foundations as they become available during play. build up the right four foundations by twos in suit, starting with 2 (2,4,6,8,10,Q,Ace,3,5,7,9,J,K). Each tableau pile may contain only one card. All cards in tableaus, the top cards of reserve piles, stock and waste piles, are available to play. Spaces in tableaus are filled from waste or stock piles. Empty reserve piles cannot be filled. 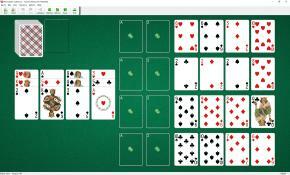 Royal Colillion Solitaire is one of the games included into the BVS Solitaire Collection.